If your child has a birthday coming up, you will undoubtedly be looking for good idea’s for a party. 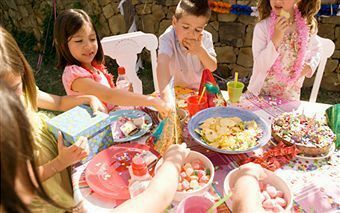 Hosting a children’s party may sound hectic, stressful and chaotic, but it can be simple and easy if you follow these tips. The key to a good party lies in the organisation and preparation. Your child probably already has a good idea of what he or she wants. Your job will be to decide what is possible and tone down the grandiose ideas that your child has. If you have the budget, a great idea for a slightly older children’s party is to go to an activity centre and hold the party there. For example, if your child wants an army themed party, take him or her and a small number of friends to play paintball and simply provide the snacks afterwards. There are many different places you could go including art centres, animal farms, theme parks, water worlds and much more. One of the most important things about a children’s party are the activities. If you can find a way to centre the entire party around one or two activities, you will have a very easy ride for the rest of the party. For example, a baking or cooking themed party, where every child has to decorate a cupcake or put on their own pizza toppings will keep the little ones busy for hours. Instead of playing five different games with a prize for every winner, you could give out prizes for the most original cupcake, the best looking pizza or the person with the most icing on their faces. The pizza or cupcake becomes either the food that the child will eat at the party or the goodie bag that they take away. Remember that several parents will ask if a sibling or two can join and that the parents or nannies might also come. This means you will have to prepare to host children, siblings, parents, nannies, au pairs and your own family. The smaller the group the better. If your child has a small class at school of about twenty children, invite them all. For younger children, having fewer guests is better. Use email or Facebook to send out invitations way in advance. This way, you will have ample time to plan the party. Another fun idea is to allow your child to draw or paint invitations to hand out to their school friends. A great way to provide cooldrink for children is to add a small amount of cordial to a large amount of water and add some food colouring for fun. Store it in a decanting container that opens with a tap. Keep it out of reach of smaller children so that they cannot leave the tap open. For adults, a few jugs of cordial and water, water with mint and lemon, and a few bottles of wine on a table apart from the children’s snacks is a good idea. For the parents, nannies and au pairs, provide a bowl or two of popcorn, some fruit and a platter of little sandwiches. One or two sliced cakes are also nice. Keep half of the food stored away until the first load is almost finished. Often, a large amount of the food is wasted, thrown on the floor or dirtied if too much is left out at once. Buy prizes in advance from stationary or educational toy stores. Avoid sweets as prizes. Things like hair clips, bouncy balls, coloured pencils and stickers are great, inexpensive toys. Every child expects a goody bag at the end of the party. Instead of investing in a plastic packet for every child, use inexpensive paper bags and get your child to decorate them with the guest’s name and a colourful drawing. Write ‘thank you for coming’ on each bag. Put one or two cheap toys in each bag. You could also buy a disposable camera and take a photo of each child with the birthday boy or girl. Slip this photo into each gift bag as a nice touch. Enlist family members or friends to help you run the party. Make a schedule for when each activity will take place, who will run it and what is needed. Have someone manning each ‘station’ of the party. For example, one individual must take responsibility for the food (including kiddie’s food, parent’s food, drinks and the birthday cake and candles), one individual must take responsibility for entertaining and running the games, and one individual for looking after the parents. Another individual can do face painting and look after any children who hurt themselves or any fights that break out. Have a first aid kit ready for any child that may hurt themselves. Have at least two ‘spaces’ for the children to play in, including an outdoors area if possible. Keep pets away from children, for the safety of both the children and the animals. Have someone manning the front door and gate to make sure that no one who shouldn’t be there slips in unannounced and that no guest is left waiting at the front door. Don’t let the party run on for too long. For younger children, two hours is more than long enough, and for older children, three to four hours is perfect.